What is the RIGHT Soldering Temperature? The right soldering temperature is something many don’t really think about. But, have you ever used one of those soldering irons with a variable temperature setting? My answer to that is, you have to get the solder joint hot enough to melt the solder. Most solder melts around 180 to 190 degrees Celsius, that is 360 to 370 degrees Fahrenheit. So we have to get the solder joint hotter than this. There are few things that will impact the soldering temperature that you need on your soldering iron. 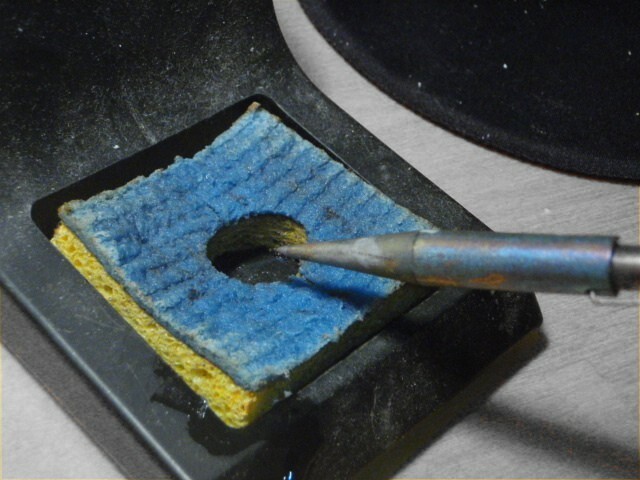 If you have a high effect soldering iron, and a large soldering tip that transfers heat in an efficient way – you don’t need that high temperature. Maybe 250 degrees Celsius is enough. But if you are using a low effect iron with a small, tiny soldering tip that transfers heat badly – you need a higher temperature. Maybe you need 400 degrees Celsius. If you have a huge solder joint, you will need a higher temperature than if you have tiny, small solder joint. The soldering temperature is also something you will figure out as you go try. If you are having trouble getting the solder to melt, it means you should turn up the heat a bit. If you are burning your components, it might be time to consider turning the temperature down. I usually solder with a temperature between 350 degrees Celsius and 400 degrees Celsius. What soldering temperature do you use? Reply in the comments field below. Touch the solder to the tip – nothing happens. But a soldering iron without temperature control is TOO HOT and it can easily damage the components, especially LEDs, transistors and IC’s. Temperature-controlled soldering irons are SO CHEAP. For $12.00 you get an item to take the place of a $240.00 Soldering Iron Station. Solder will not stick to a dirty wire. It will just “sit there” and the wire can be pulled out. When you are soldering, you don’t want the solder. YOU WANT THE RESIN. That’s why the iron must be as clean as possible by pushing it through the copper-wire ball shown above. Remove the iron and don’t move the connection for 3 seconds. Since using 0.5mm solder I have never had to remove excess solder from a joint or the iron. That’s why a spool of 0.5mm solder lasts much longer than 1mm solder. Amazing, much more usefull and interesting than the article, thank you very much. I used 360 last night to make a six-pointed star out of LEDs and it worked well. The comment above about resin and 0.5mm solder is quite valid on many points too. Got a question for you~ I have to do a wiring repair on a car, the car is outside in below freezing temperatures, and it cannot be moved to a shop or garage. Will the ambient temperature cause any problems with soldering wires together? It’s a three wire connector that i have to replace, as the plastic connector body is a little burnt and the power feed wire in it cannot maintain a solid connection. I guess it will affect things yes. But I haven’t tried it, so you’ll just have to test yourself. If you are having trouble getting the solder to melt and stick,, I would go for a higher wattage soldering iron. why don’t you just replace the connector with a new one and crimp them? i have been in repair since 1970. i usualy set my temp at 420c very fast.but i have 2 dsp chips to reflow. no visible solder conections. I will try 315c wish me luck. using hot air smd repair station. Sounds like it’s warm enough. Sometimes it helps to add some new solder to the old solder to help it melt.